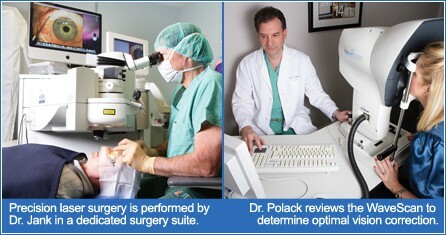 Ocala Eye offers CustomVue™ custom LASIK and Photorefractive Keratectomy (PRK) at our surgery center in Ocala, Florida. CustomVue™ uses Wavefront™ LASIK technology to precisely map the individual differences in each eye. The Wavefront™ scan is 25 times more accurate than standard methods used for glasses and contacts. An Excimer laser then reshapes the cornea to treat nearsightedness, farsightedness, and astigmatism. Ocala Eye makes LASIK affordable to free yourself from the hassle of glasses and contact lenses. We offer complimentary consultations, and finance plans are available to fit any budget including interest-free options. You could save about $40,000 on glasses, contacts and associated supplies if you had the LASIK procedure today. What makes Wavefront™ technology important? Wavefront™ was originally designed for use in astrophysics to help detect and reduce visual aberrations in telescope lenses. When used in laser vision correction, Wavefront™ analyzes how light waves travel through your eyes, mapping out the distortions and imperfections unique to your vision. This 3D map is then saved. The computer-guided Excimer laser will correct the surface of your eyes based on the information on the 3D map. Since your own unique visual distortions are accurately assessed and precisely corrected, the possibility of achieving 20/20 vision or better is increased. What three things does CustomVue LASIK at Ocala Eye have in common with the Hubble Space Telescope? Both can precisely detect light wave imperfections (aberrations) and correct them using Wavefront technology so the most clear images are produced. LASIK (Laser-Assisted Stromal In-situ Keratomileusis) is a popular refractive surgery procedure used to treat patients suffering from myopia (nearsightedness), hyperopia (farsightedness), and astigmatism. The procedure is a combination of keratomileusis, which involves cutting of the cornea, and Excimer laser photoablation, which uses a laser to reshape the surface of the eye. The cool ultraviolet beam of the laser delivers a preprogrammed number of pulses to correct and reshape the exposed surface of the eye. The corneal flap is then put back into place where it heals without the need for stitches.